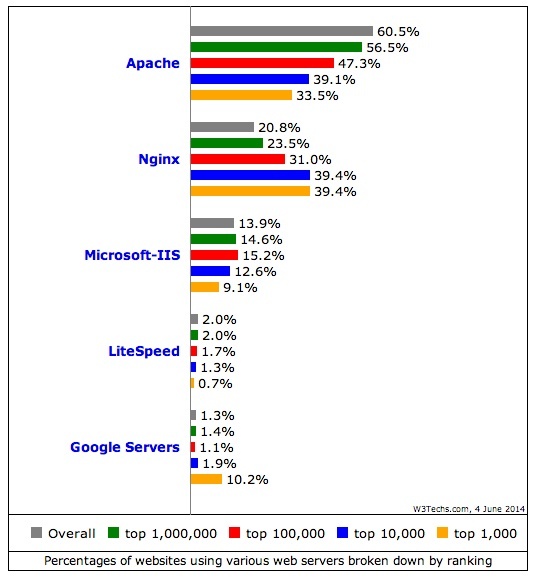 NGINX, already a popular web server, is getting more so, according to new survey numbers from W3techs.com. The web server is now used by more than one-third (39.4 percent) of the world’s busiest 10,000 websites, up from 37.5 percent three months ago. It also edged out Apache which accounted for 39.1 percent of those sites. NGINX already led the market in the 1000 sites, according to W3Techs. The company claims that big brand customers including Netflix(s nflx), Dropbox, Pinterest, Airbnb, Box, Instagram, GitHub, SoundCloud, Zappos(s amzn), and Yandex use NGINX for at least part of their infrastructure. Nginx, based in San Francisco, brought out the commercial version of the open-source web server in August with an eye on displacing Microsoft IIS as the second-most deployed server after perennial favorite Apache. (In case you’re wondering Nginx is the company, NGINX is the product.) These numbers show it’s succeeded there. Apache remains the market leader overall, used by a whopping 60.5 percent of all sites surveyed compared to 20.8 percent for NGINX and 13.9 percent for Microsoft IIS. Of course there are different ways to count market share so for more color, check out the most recent Netcraft survey. Netcraft’s historical data shows Apache still leading by a lot but with its market share gradually declining over the past few years. NGINX (and Google) show steady growth in that time.